The AutoEntry Sync Application will enable syncing data between Sage on your desktop and the AutoEntry website. *The "Manager" username should not be used as a username within the AutoEntry Sync App. Ensure you are logged out of Sage 50 and it is closed before proceeding to download the AutoEntry Sync App. Download the AutoEntry Sync App here. After installation, run the AutoEntry Sync App from your Start Menu or desktop, and log in with your AutoEntry login details. 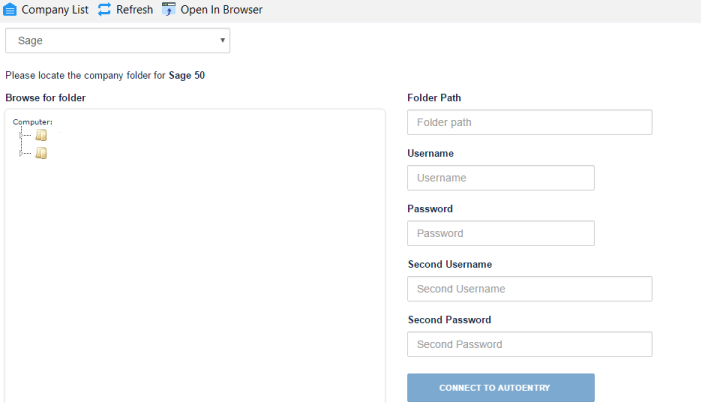 In the AutoEntry Sync App, click on the “Connect” link for the AutoEntry company you want to integrate with Sage 50. Select Sage in the drop down menu to the top left. The folder path in Step 2 should be pasted in the top right field ('Folder Path') . 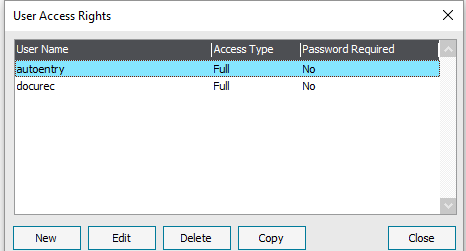 Finally, please enter the two usernames created in Step 1, and click 'Connect to AutoEntry'. Your Sage 50 and AutoEntry companies are now integrated!